Our Products — Mmm... That's Nice! Experience each delightful scent of our Mmm...that’s nice!™ hand cremes and body lotions, carefully blended into smooth, skin-loving formulations. 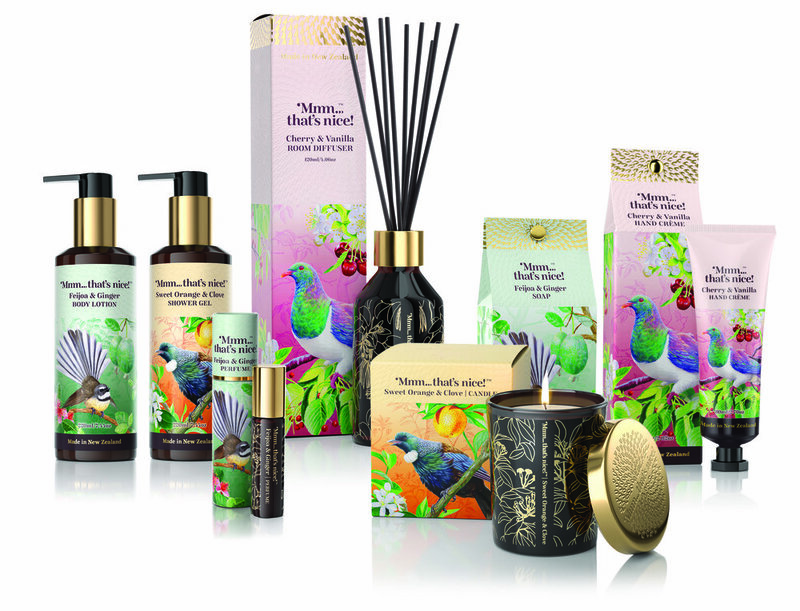 Enriched with the delicate & natural oils of Sweet Almond, Olive, Coconut and Macadamia. Awaken your senses with our beautiful candle and diffuser ranges, designed to create a relaxing ambience throughout any room with their delicious, lingering fragrance. All are presented with exquisite elegance making these the perfect gift - to yourself or someone else. Gloriously vibrant from the sun-kissed region of Northland, combined with the deep musky fragrance of Cloves and Cinnamon. Rich, red and sumptious from Cherry trees in the beautiful South Island, combined with the seductive scent of tropical Vanilla. Smooth and luscious from throughout New Zealand, combined with the aromatic spicy oil of the Ginger plant.